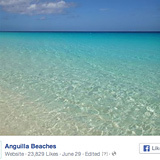 It's hard to believe how popular our Anguilla Facebook page has become. 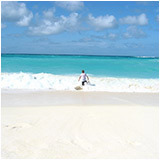 Starting back in 2011, it was tough to stay excited about sharing Anguilla with only 25 fans. Now we're over 30,000! Recently, though, we realized that there are now over 1,000 "moments" captured in photos, most of which you will never see. Some of the best pics are buried due to Facebook's "endless scroll." What a shame to lose a drone video of Crocus Bay, a photo of a sensational Sandy Ground sunset or a tasty crayfish lunch (with Johnny cakes!). 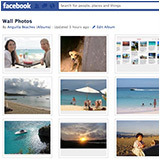 So we created this webpage, highlighting your Facebook favorites over the years, to preserve those warm memories. From the mouth-watering to the sublime, they are all here. It was a fun ton of work... We reviewed every single post, picking the best of the best (based on the number of Likes, Comments and Shares). You'll note how it only took 20 Likes to "make the cut" in 2011. By 2014, though, that number grew to 500+. And, the current "record" is 1,200 likes! But at Facebook, records are made to be broken. It's never too late to Like, Comment on or Share your favorites! If you'd like to see any of the photos below in their full size, just click on them. That opens a new window or tab. Close when finished (you'll be back on this page). 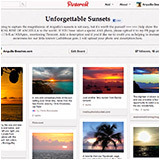 You can also share comments on this "Best of Anguilla Facebook" page by clicking here (takes you down to comments box). I'd love to hear from you. Thanks so much for all your support over the years. We're delighted to spread our still-undiscovered gem of an island to so many people. Please help spread it further by Liking, Commenting on or Sharing your own personal favorites of the "best of the best" below. One of the top photos of 2011, this one is all about Sandy Ground, the nightlife hotspot. Full of life and energy, this photo is all about the beauty and lively spirit of charming Island Harbour! A spectacular aerial shot of Cul De Sac and Rendezvous Bay. Meads Bay's glassy seas seem to stretch forever. Guess this beach? I'll give you a hint... it's anything but "Junk!" Nothing like a lazy, luxurious Sunday afternoon spent with Jacques at one of the island's top fine dining restaurants, Jacala. Our first dog to join our family, Touptsi! Garlic bread & BBQ... a combination that simply can't be beat. Sushi, in Anguilla? This was snapped at a time when Viceroy was the only spot on the island serving refreshing sushi bites. The best photo yet for 2012, it's not hard to see why! And looking the other way, from the sea to the sand, the view is equally beautiful. Yuki cooling off in the Meads Bay's shimmering seas. Snapped in August, the ocean is as calm as a pond that time of the year. The perfect vacation from a vacation? A day trip to idyllic Sandy Island. 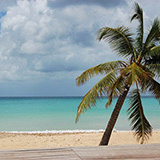 How many days would you trade for a peaceful stroll down Shoal Bay beach? 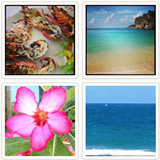 Fine Italian dining came to Island Harbour's picture-perfect shores late in 2012. This is the view from Elite! One of our local celebrity chefs, Garvey , owner of the popular Sunshine Shack! The skies were ablaze with this sensational sunset back in September of 2012. From Anguilla to St. Martin to even the BVIs and the USVIs, everyone in our part of the Caribbean snapped photos of this stunning sight that evening. 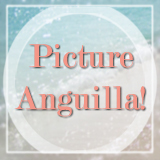 This photo marked the beginning of one of our biggest contests, Picture Anguilla! THE best photo of 2013. Just looking at it soothes every tension. Who would have thought Rex had that "x-factor"! We discovered this special spot on a day exploring the island with our interns from Albena Lake Hodge Comprehensive School. Do you know this location? Can you hear the waves gently breaking onshore? It's a long way down to Sandy Ground! Back Street, overlooking Sandy Ground, provides some of the most picturesque views. A classic Pumphouse rum punch enjoyed aboard Laurie's historic sail boat, Tradition. Two ingredients for a memorable day. The Sunset Lounge is indeed aptly named! Have you met Tequila Sunrise Villa's cute and cuddly Billy? The best beach photo of all time! The big and beautiful Shoal Bay East! Meads Bay in all her splendid, unedited beauty! Blissfully calm under the shade of a palm. A stunning Sandy Ground sunset post-boat race. Arguably one of the top restaurants for a "lime" on a Sunday afternoon. And who remembers this most special night? Crystal clear, without light pollution, Anguilla was the place to be to witness the Supermoon! Here's to a wonderful rest of the year and many more warm, Anguilla memories to come!